They called this flaky southpaw “Spaceman” and he certainly was “out there” when it came to his views on life here on Earth. But for three seasons, beginning in 1973, he was one of the American League’s most effective left-handed starters, winning 17 games in each of those years and helping Boston reach and almost win the seventh game of the 1975 Series. Lee was born in Burbank, CA on December 28,1946 and grew up in a neighborhood of Hollywood celebrities. He played his college ball for Rod Dedeaux’s powerhouse USC team and was selected by the Red Sox in the 22nd round of the 1968 MLB amateur draft. 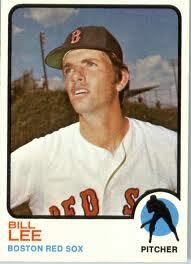 He made his debut in Boston in 1969 and became an important part of the Red Sox bullpen for the next fours seasons. Then in 1973, Boston manager Eddie Kasko made Lee a starter and he proceeded to pitch 827 innings of baseball over the next three seasons. His best year was probably 1975, when he went 17-9 during the regular season and hurled four shutouts. He then got two starts in that year’s World Series against the Reds and pitched well in each one, even though Boston ended up losing both games. Then in 1976, two newcomers arrived at Fenway who would have a deep influence on Lee’s future. The first was Fergie Jenkins, the veteran pitcher who turned out to be a perfect hard-partying companion for Lee to grow very fond of. The second was new Boston Manager, Don Zimmer, who replaced Darryl Johnnson as Red Sox skipper in July of that season. Up to that point, the Spaceman had already had a rough year. After a slow start he injured his shoulder when Graig Nettles fell on it during a brawl at home plate in a game against the Yankees in late May. When Zimmer took over the team, he immediately clashed with the pitcher over Lee’s work habits, his carousing off the field, and his frequent and very vocal criticism of the manager’s handling of the team. By 1978 it became overtly clear that the two could no longer coexist. Boston traded the then about-to-turn-32-year-old pitcher to the Expos in December of 1978. Lee fell in love with the artsy cosmopolitan lifestyle of Montreal and went 16-10 during his first season pitching north of the border. But he couldn’t keep up that pace for long. He was released by the Expos in May of the 1982 season. His 14-year lifetime record in the big leagues was 119-90 with a 3.62 ERA.